Our last day in Paris, we spent the morning at Notre Dame and walked back to the hotel. It was around lunch time and I really wanted to try a creperie I had read about: Crêperie Saint Eustache. Turns out, it was right around the corner from our hotel. I had somehow managed to not notice it for 11 days! We sat inside, not outside. The people were so friendly and there was an English menu. It's only open for lunch, from noon until 3:30 pm. We opted for the Menu 12.90 Euro: a savory crepe, a sweet crepe, and a drink (cider or Coke). SP chose cider. I chose Coke. 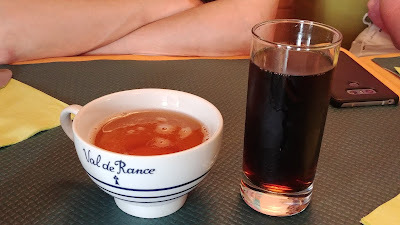 I dared to ask if I could substitute another beverage because I don't like cider nor Coke and the tea was listed on the menu for the same price as a Coke, but the woman looked shocked and said no no no. 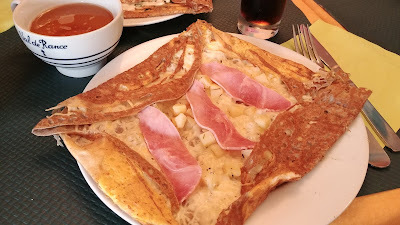 I opted for the La Saint Eustache Crepe (egg, ham, Emmental, and potato). It wasn't a problem to get the egg cooked! I really liked this. After a lot of egg-cheese-ham crepes and croque monsieurs, it was nice to have the diced potatoes on this crepe. SP chose La Vegetarienne Crepe (fresh cream, spinach, onion, Emmental). He said it was very good. 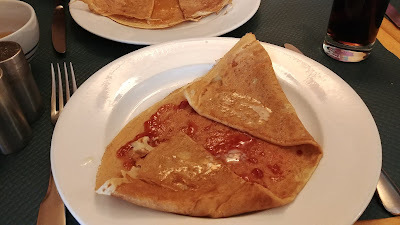 For our sweet crepe, we both chose jam, apricot for him (above) and strawberry for me (below). The sweet crepes were yummy, too. So the good: the lady was wonderful, friendly, spoke a bit of English, and there was an English menu. 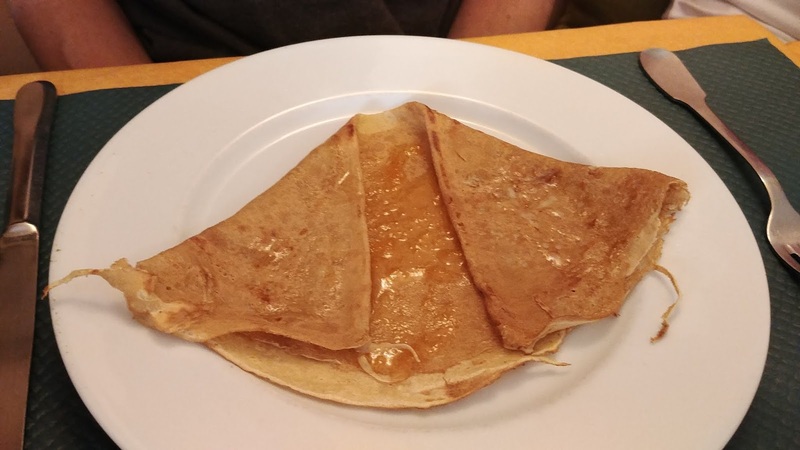 The crepes were yummy. 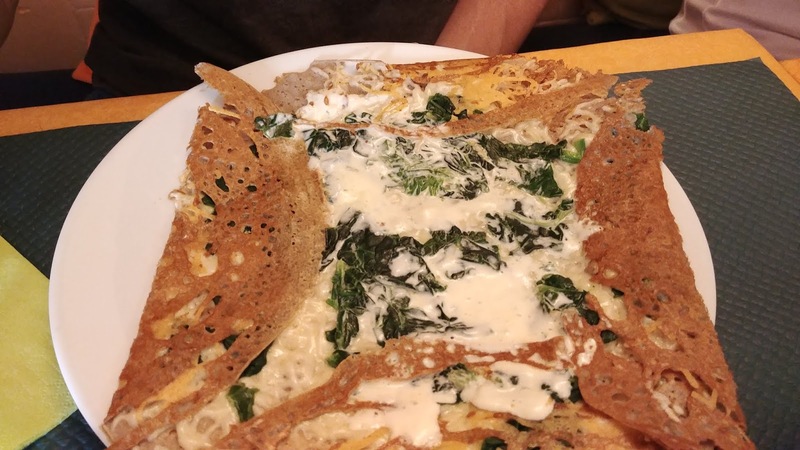 The not so good: my mom was with us but didn't have the special, she just ate one savory crepe & ordered a wine. She gave us cash to add to our cash to pay the bill (the place is cash only). SP was expecting 10 euro in change but received only 5 so he questioned it. At this point, the guy there was handling the payments and he didn't speak English and this was way beyond my French. It got kind of confusing trying to explain and there was frustration on both sides. In the end it turned out that SP (we) mistook a 7 for a 2 because of how it was handwritten on the bill and that was the source of the confusion (and yes, I now wonder why we didn't actually add up the bill in our minds, we just looked at the final number, took the money from my mom, and then plopped down enough to cover the circled number on the bill). The nice lady figured it out and was laughing and explaining to the man (I could understand her explanation to him, I just couldn't have come up with the French words on my own), but he was not at all happy, he was pretty grumpy, and we felt horrible. To make it worse, SP was a little embarrassed and frazzled and we were all mumbling sorry/desolee and looking sheepish and because it was a little tight inside, SP crashed my wheelchair into a shelf of breakables on the way out and over a bump. Nothing fell, nothing broke, it just made us feel even worse. We couldn't leave and make the turn at the end of the street fast enough. We felt awful. I hope they don't hate Americans because we couldn't tell the difference between a handwritten 2 and 7! 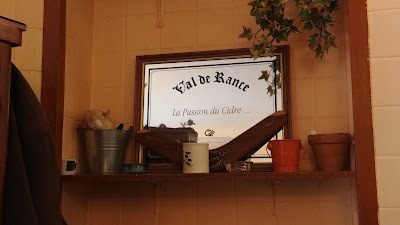 If we are back in Paris, we would definitely go back - and hope that they have forgotten the crazy, confusing people!